I absolutely LOVE the simplicity of this project! It is clean, simple, and absolutely elegant! This card showcases product from the brand new Spring Mini Catalog. The design on the front is made from our new, “Dress Up Framelits“. In addition to framelits, there is a coordinating stamp set called, All Dressed Up. 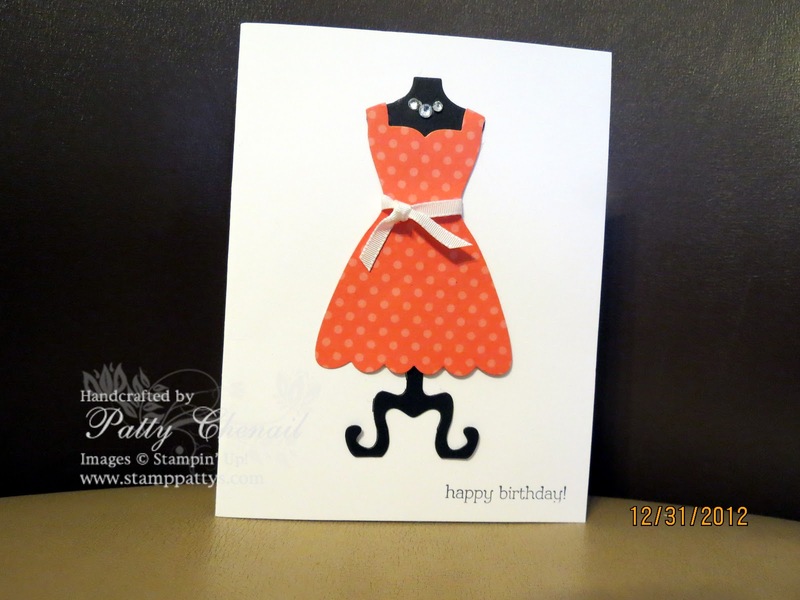 I cut the dress stand out of basic black cardstock and then used Calypso Coral DSP for the dress. I couldn’t resist dressing it up a little further by using some of our basic rhinestones and our 1/8″ taffeta ribbon in whisper white. I know that I am going to get a LOT of use from these new framelits. How about a little black dress, or a beautiful wedding gown embossed with one of our fabulous embossing folders and adorned with rhinestones or pearls?? ?